I entered a few science fairs in my time. One time I tested steel wool in different fluids to see what elements caused them to rust the quickest, and another time I created an awesome tornado in two pop bottles. I never won anything - the judges were too bowled over by the girl who made Twizzlers dissolve in Coke Classic. For the record, Mr. T did the same thing in college, only with Coke and the enamel on his teeth and he never got a blue ribbon. Just inordinately high dental repair bills. But whatever. My collection of "Participant" badges just created a desire to find things out on my own terms. On a completely unrelated note, I I like coffee. That shouldn`t come as a surprise to anyone who`s ever known me for longer than five minutes. When Starbucks introduced the new Trenta size a couple years ago, I was appropriately excited, until I learned the 24 ounces of life-giving liquid gold would only be available in cold drinks, and only through the U.S. What, you think Canadians just don`t like gigantic cups of coffee as much as Americans do, Starbucks? 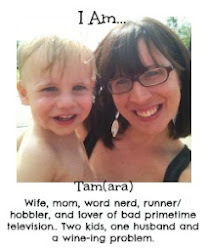 Come spend a day with me (and stick around through the night when Little Dude is teething). Since two of my closest friends started working as baristas in recent months, I`ve been spending extra time with the siren when they`re on shift. Kind of like conjugal visits for people addicted to caffeine. Tonight, when I went into the store, I distractedly picked up a plastic tumbler on display and noted it looked bigger than usual. Since Starbucks knows that size matters and accordingly prints the cup capacity on the bottom, I flipped it over, peeled back the price sticker and nearly died from a happy coronary when I discovered it could hold a whopping 24 ounces. 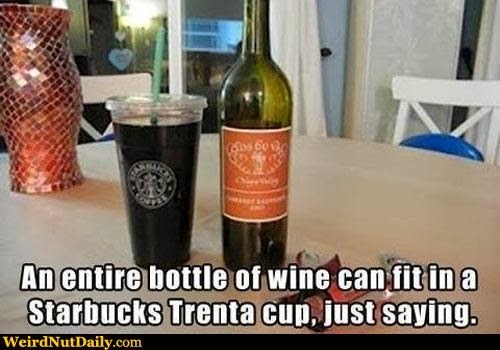 You can`t order a regular Trenta in a disposable cup, but for reasons unknown, you can buy the permanent tumbler, then watch your barista try to figure out how to make a drink that size when you bring in your own. The entertainment value more than pays for the cup itself. The prospect of extra-large iced caramel macchiatos doesn`t really get me too excited. As a rule, I don`t particularly love cold coffee and I`ve had an aversion to Frappucinos since I hung up my own green apron five years ago. However, numerous friends, who know my only greater love than coffee is wine, posted the following photo on my Facebook timeline (numerous friends and numerous times, I might add. Apparently word has gotten out). So back to my science background (even though I failed high school chemistry AND biology. I blame the lack of recognition in my elementary years). Naturally I had to try this little experiment for myself. The thought of enormous iced lattes may not thrill me, but wine in my very own sippy cup sends me to my happy place (and incidentally, causes me to do a dance for obvious, alcohol-fueled reasons). Lo and behold, my field test proved one of those crazy viral internet photos is actually accurate! I may not have tried the one pot Italian meal yet, but really, who needs complex carbohydrates when they discover they have 750 ml of Riesling in a spill-proof cup on a weekday evening? The only problem is, I`m a fast drinker. I always have been. I get it from my dad - back when we drank iced tea, we were a nightmare for a server at restaurants that offered bottomless refills. A regulation-sized wine glass means I have to get up to pour when it`s gone, and therefore, am very aware of how much I`m drinking. When it`s all in one cup, suddenly it`s gone and what do you know? I can suddenly see through time. Meanwhile, if Mr. T asks, it`s my new morning protein smoothie cup. Because apparently I`m training to become the new Ms. Universe. Commendable science experiment! I'll be attempting that feat when I next hit the playground with my "lemonaid"
You are brilliant. I say that mostly because of your writing, but your scientific prowess is astonishing too (though I thought perhaps that was obvious and therefore not something that needed saying). But yeah, I can see sucking back an entire bottle and not realizing it. Whoops.